How nice would it be when having a tasty dish of chicken curry with a bowl of hot rice? 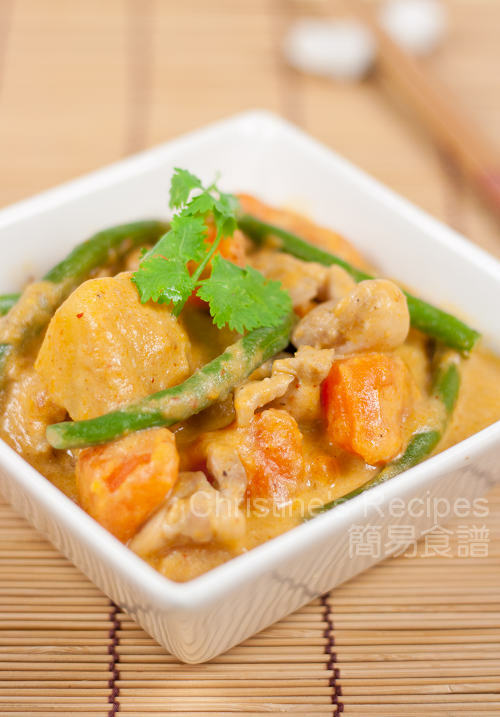 I always love to cook this Chicken and Sweet Potato Curry with Thai red curry paste. The curry paste is handy to use and got all the necessary spices in it already. Sometimes going for such a modern convenience is a good ending of a hectic day with a tasty, yummy, juicy dish for dinner like this. This dish looks so humble, yet with rich flavours absorbed by the sweet potatoes. Oh, I nearly forget to mention the little greens. They are our favourite extras in curry too. I used this red curry paste for this recipe. Do you like Thai curry? 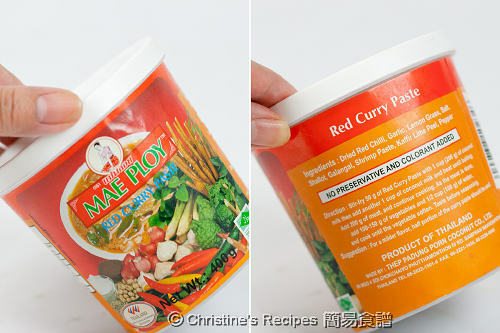 Do you have any favourite brand(s) of red curry paste? Do drop a line to let my readers have more good choices if you have, please. Rinse chicken and wipe dry. Cut the chicken into 3cm (1.25inch) pieces. Mix with marinade for about 20 minutes. Heat oil in a wok or a saucepan over medium heat. Cook chicken until the colour changed white. Set aside. Add some oil in wok, saute onion until translucent. Push to the sides of wok, add garlic and red curry paste in the middle. Beware not to burn garlic (Add more oil if needed.) Once you smell the aroma of curry, stir and mix all ingredients. Add the sweet potato and potato. Continue to stir fry and mix well for 3 minutes. Pour in some water to cook until sweet potato begins to be softened, about 5 minutes. When the water dries up and reduces to half. Add coconut milk, green beans and cook until all ingredients are soft. Toss back chicken into curry mixture and cook for a while. Season with salt and sugar if needed. Taste by yourself. Dish up and garnish with coriander. Best served hot with Jasmine rice. As the power of the stove used in every family is different, the size of saucepan is not the same, so the amount of water you add to cook the sweet potato and potato would be different. Just use enough water to cook the sweet potato and potato until soft. It shouldn't be too much water left in the end. Otherwise, the curry sauce would be too runny. And in this cooking way, the flavour of coconut milk won’t be diluted. You might like to cook the sweet potato and potato in boiling water in advance. It’s much easier to control the texture of the sweet potato. Just toss them in with the chicken in coconut milk and curry mixture. But the method suggested in this recipe can help you keep all the goodies and sweetness of sweet potato in a wok and retain all the flavours of the veggies in the curry. This dish definitely needs rice. Which reminds me that I do have some red curry paste that I need to use. I don't think we have the brand that you have on that photo. Definitely an easy and delicious dish for everyday meals. Thanks Christine. oh sweet potatoes and curry...yummy!! Oh my gosh...I super duper adore Mae Ploy too. I even have their Thai green curry paste, Panaeng paste and their Masman Paste. All so yummy!!!! And sweet potaoes instead of the usual potatoes, how creative. I can eat a lot of rice with this alone! I like curries in winters and great idea to use sweet potatoes instead. Nice and sweet too. Like those greens in curries. More color = more balanced in nutrition! yay! 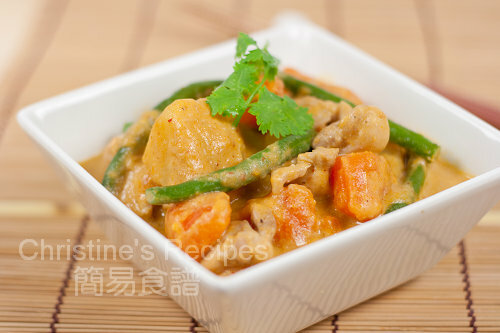 Christine - I have been craving for chicken curry since this weekend! Now I know the recipe to use - I know I can always trust your recipes! Sweet potatoes curry....and all the greens! Beautiful and flavourful dish. A beautiful combination of flavors - I adore coconut milk and curry paste. Your photo is lovely, too. Delicious curry with sweet potatoes! I love and miss curry, hope to make it soon! I like that you added sweet potatoes to it, I've never seen sweet potatoes in curry but I can imagine that it's very tasty! For this recipe, you can use either cornflour and cornstarch. It's fine. This is awesome! At first i was a bit worried that the taste of the sweet potato will be a bit overpowering.. but instead it gave the curry such a great texture, it's yummy! This is one recipe which i will continue to cook througout the coming winter months. Thanks, Christine! Aw, so nice to have you dropping by, and thanks for telling your friends of my site. Yeah, surprise your mom with more Chinese dishes you cook for your family. High 5 for you! simmering this curry as i type. it smells delicious. thank you for another delicious recipe christine! Does it go well with roti? As I prefer roti than rice? Haven't tried to go with roti. Guess that it'd be nice. My vegetable store has only "white" sweet potatoes today. I didn't even know they exist until today and wonder if they taste the same as the yellow ones. Will they work too? It will work for cooking curry too. Different type of sweet potatoes contains different amount of water, and has different level of sweetness. Just pay attention to their cooking time and adjust the seasonings. You won't mess up the dish if using white sweet potato.